The original Ten Tips To Not Trip Up A Speech post generated discussion beyond my wildest hopes via MarketingProfs' DailyFix Ten Tips (Plus!) To Not Trip Up a Speech, Becky Carroll's Speaker Tips and Daksh's Speaker Tips From The Masters. As 2007 winds down, it seems only fitting to recapture them all in a mashup yielding not 10+, but 50 Top Tips To Not Trip Up A Speech. 2. Drink lots of water, ideally with lemon [I avoid ice]. Have water with you at the podium to minimize dry mouth. 3. Avoid ice cold water, says Peter Kim. The theory being that cold water constricts the vocal cords, which leads to drinking more. Tips for Maintaining a Healthy Voice supports part of the theory. 4. From a practical perspective, I dislike having ice fall out of my glass as I'm trying to get to the last drops of water, and Becky Carroll says the ice makes too much noise in the microphone anyway. 5. Always keep a mint or hard candy with you at the podium. Sometimes a sip of water doesn’t clear the “frog” in your throat! 6. Check out the Public Speaking Blog and learn how to be good to your vocal cords. 7. Per Mack Collier, if you have butterflies, eat a few saltine crackers. It will quickly settle your stomach. 8. Turn off your lavalier microphone if you use the bathroom before your speech. 10. In the few minutes before the presentation, clench and unclench all of the muscles in your body. Do that again and again. It will help dissipate excess energy. Remember to breathe. If you tend to race at the beginning of a presentation, then consciously make plans to slow yourself down and breathe. 11. Remember that you are the expert. Express that energy and passion and have fun. You will be contagious. Guaranteed! 12. At the same time, Suzanne Obermire says be human! Even though you’re up there as the expert, make fun of yourself, laugh a little, ask for input/comments/questions. There’s nothing worse than the stuffy, know-it-all presenter. 15. Practice, practice, practice. Videotape yourself speaking. Practice some more, especially the parts of the presentation when you feel most vulnerable. If it’s at the beginning, then learn the beginning by heart. Understand the rhythm of your material. 16. Paul Barsch reminds us that speaking is a craft and discipline that one improves only through constant practice. He recommends joining a professional speaking group to fine tune and improve your speaking skills. These groups often offer critical feedback to work out the kinks in voice projection, rate, pitch, hand gestures, etc. 17. Ian Straus says that "tips" are the wrong way to go. Public speaking is a performance skill. And it's learned, not born: Who among us was born talking? Just as golfing "tips" will never make you a Tiger Woods, whereas practice made him a champion, so "tips" on public speaking won't make anyone a good speaker. Practice will. Better to recommend Toastmasters International which provide the repeated practice and coaching to actually help people improve their public speaking and then maintain that level of skill. 18. Project your voice and your presence. If you’re not sure what that means, then go into an empty church or auditorium and practice projecting both without a microphone. Try singing, too. Fill the entire space with your voice. That will really help things click. 20. Diva Toby takes a moment before the speech to remind herself that her purpose is not an ego trip, but rather to serve the people in the room. 21. Mack Collier suggests, if at all possible, spending time prior to the speech becoming familiar with the environment. Know where everything is and be as comfortable as possible with your surroundings. 22. Make eye contact, with every part of the room. Hold contact for a few seconds. If you forget, place boldly dressed friends in strategic places and look at them! 23. Ann Handley encourages friends throughout the room to nod and smile at her. One of the things that always unnerves her is the "blank screen" of an early morning audience, or a tired audience, or an audience that is staring into a bank of laptops... It helps to have feedback from a friendly face, even if that person is a plant. 23. Similarly, Becky Carroll “works the room,” but if you find a face or two that are frowning, don’t take it personally! Focus on the friendly face and keep coming back to that person for encouragement. 24. SMILE when you connect with those people scattered throughout the audience. 25. Daksh says to look into the eyes of your audience. Do not focus towards only one section of the crowd. 26. Daksh also encourages moving with your audience. If you feel your audience is unclear, politely ask ‘Are you with me?’ or something which stresses on the clarity of point. 27. Brandon finds two or three people in the room that are (or at least appear to be) interested in what he is saying and speaks to them. That way, he is focusing on several areas of the room and not sweeping across everyone with his eyes. It helps him feel like he is having a conversation with just a few people and relaxes him. 28. Becky Carroll likes to open with light humor (not too many Dilbert cartoons, please!) then sprinkles humor throughout via pictures or in her comments. She makes for a conversational speech by involving the audience in show-of-hand polls, throwing questions out to be answered, or even taking questions to keep the energy going. 29. Beware, though, not to get side-tracked by less relevant questions or too many questions [particularly critical if you have limited time for your presentation]. 30. The inimitable Phil Gerbyshak says to smile wide and pause to see who smiles back. This small gesture can help you identify your friendlies in the audience, and these are the folks you can go back to when you need an energy boost. 31. Do not read your presentation. 33. If you are comfortable in front of the crowd, get out from behind the podium! A bit of wandering makes your presentation more visually interesting. 34. Be sure to use pauses to highlight points you want to make [per Valeria Maltoni]. 35. Speak slowly, especially if you are passionate and interested in your topic [per Gavin Heaton]. 36. Phil Gerbyshak says to S-l-o-w d-o-w-n when making important points - Take the time to breathe when you’re making your most important points. Even stop periodically to give people’s brains a chance to catch up. 37. Include something humorous at strategic points during your speech. A light laugh is always good to keep people focused! 38. Be yourself. Let your personality shine through [per Elaine Fogel]. 39. Shelley Ryan's old business partner taught her when speaking with a .ppt deck to, just before moving to a new slide, say or ask something relevant/compelling/interesting that ties into the next visual. This approach may not sound like a big idea, but most presenters seem to do the opposite (using the slides to jog their own memory instead of keeping an audience riveted). 40. Phil Gerbyshak uses a “quote slide” to make a point. For example, when he talks about the power word-of-mouth can have to ruin a business, he uses a Jeff Bezos quote to make his point even stronger. 41. Don’t be afraid to change the background color of your slides to make a transition. Who says all slides have to be exactly the same? Change it up in the middle, then go back to your template. 42. Better yet, don’t use a template at all, just put a picture and a few words on a slide. 43. Phil Gerbyshak's last tip is from Guy Kawasaki: Remember the 10-20-30 rule: 10 slides max; 20 minutes max; 30 point font. Sure, not perfect if you have a 2 hour slot, but if you’ve been given 45 minutes, be ready to shorten it to 20 minutes in case the CEO of your host company decides s/he wants to share some of your time on the platform to make some important points to her/his company. 44. Becky Carroll likes to keep her template simple: a few words/bullets, and a nice picture to keep it interesting. Quotes are very useful and lend credibility, as do the right statistics. She shies away from multimedia, as there are just too many things that seem to go wrong with sound, etc! 45. Minimize the number of bullets on each slide. No one can read a slide with too many words on it! Three bullets of short phrases are sufficient. 46. Do not rely heavily on the content of slides. 47. Glenn (Customer Service Experience) Ross highly recommends reading The Exceptional Presenter, a book he recently blogged about. Major learning from the book: When planning your presentation, start with your key points, not with PowerPoint. Since reading the book, he doesn't consider PowerPoint until after fleshing out those key points. After my original post, I came across Library Revolution's On Knockout Performances based on Quicksprout's 10 Tips For a Killer Presentation [also referred to in Lifehacker's Public Speaking posts]. 48. Be honest and tell the truth. 49. Watch what you say - especially those 'um' or 'ah' [or, in my case 'eh']. 50. Differentiate yourself. Be unique and memorable. You are branding yourself when you speak. So, there you have it: 50 Top Tips To Not Trip Up A Speech. And, Hunterz Ignite's Experts Speak organizes several of my original tips into a chronological check-off list. What an enlightening and inspiring experience! I greatly appreciate all the feedback and comments and the opportunity to create something far better than the original 10 tips. Thank You and Happy 2008! Did you see The New York Times article titled Inside Apple Stores, a Certain Aura Enchants the Faithful by Katie Hafner from 12/27/2007? It offers a fascinating glimpse into what makes Apple stores so appealing. Were you aware that Apple retail stores generate 20% of the company's revenue? From the article [and personal observation], here's how - by creating a Third Place around technology products. A place for connecting and gathering, for lingering and interacting with product and meeting like-minded people. It's a source of knowledge, information, help and fun. The overall effect is inclusive, extremely welcoming and filled with an amazing level of personal service. Remember what Chris Ramey referred to in What Luxury Marketing Can Teach Us? Successful stores are extremely customer-centric. The article describes The Apple Store as the Nordstrom of technology. That says a lot. It shouldn't surprise you that I often refer to The Apple Store in retail experience presentations. My first ever experience at the SoHo store in Manhattan radically affected my appreciation for retail environments.... the buzz, the energy, the positive vibe of the crowd. Despite a not-so-inspiring-human-element when I first visited the 5th Avenue Apple store, I remain inextricably drawn to Apple Stores where ever I go. The stores themselves echo the simplicity of the Apple product, forming a simple, bright, engaging backdrop for interaction between shoppers and products. Isn't that the ultimate goal of a store? This 12/17/2007 article titled Retail Design For 2008: Thinking Outside The Big Box refers to several stores including Apple that have "redefined retail as sort of a playground for adults." This development is not "an anomaly.... but rather a redefinition of a retail storefront as strictly a commercial medium." Retail is becoming more emotional and a place for "creating stories around the brand that connect with people beyond merchandising or designer names" per Marc Gobé. Paco Underhill mentions sophisticated lighting and creating intimate retail spaces to help redefine retail environments. 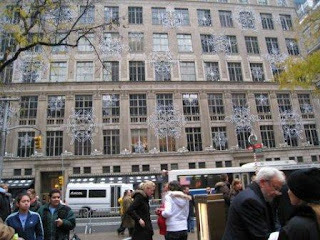 Gobé adds: "...Apple's Fifth Avenue shop use lighting and materials to "bring forth the brand." Looking at The Apple Store from that perspective, I absolutely see it all come together. Combine that with the impeccable and impassioned personal attention that the NYT article describes and you get a must-see-for-yourself ultimate retail experience. 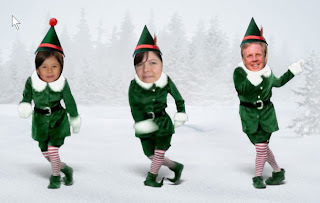 From my family to your family, I offer you this year the Whittemore Elf Yourself Family Dance. Last year, in It's Time To Elf Yourself, I had a blast doing my first ever elf solo. It's even better doing it as part of a team. Somewhat similar, I imagine, to how Santa feels making things happen with his elf team for Christmastime. Talk about pressured deadlines. Teamwork is the only way to go. My thanks to Chaos Scenario's John and Cam exposed for getting me into the Elf Time mood. Consider giving OfficeMax Elf Yourself a try and discovering your inner elf. By the way, did you know that there's a Yule school to teach Santa's elves? So writes Agnieszka Flak in the 12/21/2007 issue of Reuters. It's an intense job, but there are at least 500 graduates. Now, if you have any questions about elves, I've located an excellent resource: Commonly Asked Questions About Santa's Elves. And, now for my greatest find...... Did you know that Santa has a blog called Santa's Elf Club? Finally, don't forget to Track Santa [this Google post gives you history and steps on how to do so for 2007. However, if you're feeling the least bit grinchly -- as I did several days this past week when I really, truly, absolutely believed that there was no way in creation that I could ever get everything done in time -- then you might want to Meet C.B. 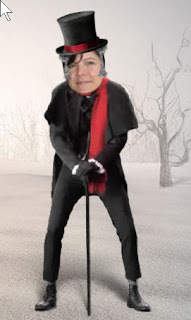 Scrooge. It's a solo act. And possibly too similar to my elf gig. I like the hat, though, and black is definitely more slimming than the green suit and candy cane tights. Now, Drew's post also mentions that you can Turn your voice into a chipmunk's. I had great intentions of recording a memorable, one-of-a-kind, inspiring, yet thoughtful message wishing you all wonderful Holidays and great happiness and success for 2008. However, I can still wish each and every one a most wonderful Holiday season filled with family, fun, warmth, inspiration, happiness and peace. 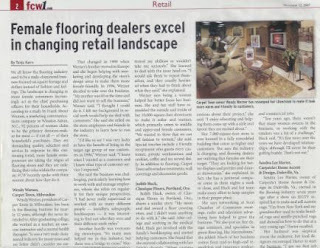 Thank you for reading, subscribing, commenting and supporting Flooring The Consumer. I greatly appreciate it. Back in early November, Robyn McMaster from Brain Based Biz issued me the Think Different Challenge in Thinking Differently about Giving Advice. For one, thinking differently helps nurture creativity. For another, thinking differently about marketing to women and the retail experience occupy most of my waking moments. And, I love the work that Deborah Tannen has done around language and communication styles and how thinking differently can help us break some of those patterns. In deciding on my Think Different Story, I waffled back and forth until it hit me that one story superceded all others. In fact, it has turned into a 'defining moment' with respect to thinking differently. My story involves my daughter, sleep and bedtime. Yes, bedtime. It's a challenging time. Especially as she gets older, more sophisticated, more complex, more mature... She fights shutting down at the end of each day, slowing her imagination down, curbing her enthusiasm, calming her energy and ... not talking [by the way, this is the only time when I get the lowdown on any situations at school]. This particular evening, we were already one full hour beyond her bedtime and she still wasn't getting any closer to sleeping. I tried threats, cajoling, walking away, ... without success. "You must go to sleep now" I told her. Finally, I realized that I was doing everything that I preach against doing in the retail environment. I was trying too hard. I was forcing a hard sell on my daughter and she wasn't buying it! I backed off. "Take as long as you want to fall asleep," I told her. And I genuinely meant it. Within two minutes, she fell asleep. Now, you might suggest that, by that time, another threat might have worked just as successfully. However, up to that point, she had been actively fighting the sleep request. And winning. As soon as I thought differently and made her a part of the solution, she fell asleep. Since then, I often think of that moment to prevent falling back into an unsuccessful pattern. It's my Think Different reminder. I invite all of you to participate in The Think Different Challenge. 1. Write a new blog post in which you “think different”. Interpret the challenge the way you want. 2. State that the post is a part of the Think Different Challenge and include a link and/or trackback to this post so that readers know the rules of the challenge. Feel free to use the above banner (inspired, of course, by Seth Godin). 3. Include a link and/or trackback to the blogger who tagged you. 4. At the end of your post, go ahead and tag some fellow bloggers. Don’t forget to email them to let them know they have been tagged. 5. That’s it! Just sit back and enjoy reading peoples’ responses to the challenge. 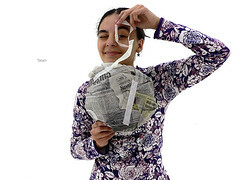 If you want to read some of the responses to the Think Different Challenge, read The Think Different Challenge from The Synergy Institute Blog or check out this Think Different Challenge Google search. E-Shopping Expectations: What About The Customer? 'Tis the season for frantic purchases. For us, it's also - because we have a Thanksgiving child - the season for returns. And I am tremendously grateful for hassle-free returns. Right now, I am frustrated with HearthSong. Yes, they have cute stuff. But, they sure are hard to do exchanges with. In fact, they are so difficult that I encourage anyone who isn't purchasing with the express approval of the recipient to stay away. + I can return gifts. + I cannot make an exchange. + I may receive a certificate, only good at HearthSong, for separate purchases. But, I must wait until I receive my certificate to make the new purchases. I only get my certificate after shipping back my gifts, and waiting for HearthSong to receive my return. I can only ship once I obtain a return shipping label. Technically, I shouldn't even be receiving a certificate. I had to obtain special approval from the manager. At least, that's positive. Technically, the giftor [my sister-in-law] should have been contacted for approval. Talk about a potentially messy scenario. Luckily, she knows I'm making a return, but still. It's not as if I stole the merchandise. We received it as a gift and legitimately need to return it. Isn't that reasonable? Kind of a clunky policy, don't you think? This time, though, I thought I should also share my tale with you. So, I ask you. How do you handle returns? How clunky is your experience, especially from your customer's perspective? I hope it's better than HearthSong's. Returns represent an important part of your overall retail buying experience. It's one of those consumer touch points that can make or break how positively you are perceived. It's one of those opportunities for truly cementing a strong relationship with a customer. Think on the stories you've heard about the Nordstrom customer service experience. Delicious details that forge relationship and create word-of-mouth buzz. If you're not quite sure, then read this Business Week article from 11/21/2007 titled In Small Biz, There's No Small Stuff, When it comes to customer service, take a tip from a good police chief: The small things can be just as important as the high-profile ones by Keith McFarland. It will certainly put into perspective how critical details are in the overall customer service experience. Greg Furman and Chris Ramey originally uploaded by cpramey. Have you considered how much luxury marketing can teach us? Christopher P. Ramey, Chairman of The Florida Luxury Marketing Council, shares with us some of his wisdom. He has just expanded the Florida Luxury Marketing Council -- from The Luxury Marketing Council of Miami, The Luxury Marketing Council of Fort Lauderdale and The Latin Luxury Marketing Council --to Sarasota. Chris now owns four of the 17 Luxury Marketing Council chapters less than a year after launching the Council! Impressive. I got to know Chris during his CCA Global days, when he was President of The International Design Guild [check out their Dabbieri Blog]. 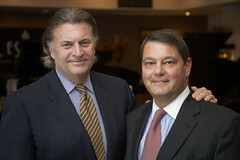 He has been focused on the Luxury market for the past fifteen years and contributes to FCW. Most recently, Kim Gavin interviewed him for an article titled "Luxury shoppers defy definition, demand attention" in the 11/12/07 issue as did Juan Fernandez for EL Espectador Colombia [article titled "El lujo incluyente" en espanol]. At the upcoming Surfaces 2008, Chris will be presenting "Ten Essential Keys to Entering the Luxury Market" on Friday, February 1st, 2008. CB: Chris, how did you get started in the luxury market? My first job after college was with Macy’s in their Executive Management Training Program. I still remember the call from the HR Director asking me which department I wanted to be assigned to. I was a couple months from graduating and - naturally - focused on money. So, I told her “jewelry” because I thought that was the most expensive product they sold. Unfortunately, it was a lease department. The next most expensive category was carpet, and that's where I decided to go. After being an assistant buyer in Carpet and Rugs at Macy's, I accepted a position with Cabin Crafts Carpets as a territory manager. I started my own flooring store in 1984 with the intent to always remain the premium brand in my marketplace. In the late 1990s, I started focusing completely on the luxury market. That's when I became a charter member of The Luxury Marketing Council of Atlanta. Back then International Design Guild had only 18 members. Today it’s grown to over 100 showrooms and is extraordinarily well run by Krista Eliason. CB: Would you explain what the Luxury Marketing Council is? The Luxury Marketing Council is a think tank and greenhouse for marketers focused on the affluent. “Council” may be a misnomer. We are a marketing organization that creates marketing collaborations, forums for best practices, and a sharing of information among organizations that don’t compete, but share the same customer. Your blog is an excellent example of our philosophy that information and knowledge are the most powerful products in the world. Worldwide we have 800 august members. In Florida, we are now over 84 members including Ocean Reef Club, Samuel Getz Private Jewelers, Luxury Trips, Dolphin Stadium Private Club, Blue Star Jets, White Good & Company Advertising, Delano Hotel and The Shore Club, Mandarin Oriental, Four Seasons Hotel, International Design Guild, Ringling College of Art and Design, Camper and Nicholson, Florida Designers Review, Bertram, SeaDream Yacht and it goes on. I'd like to note that some of our members are based elsewhere. As you might assume, a very large percent of the affluent in the United States, Latin America and Europe are connected in some way to Florida. And the product we provide is portable. CB: What about your expansion to Sarasota, Florida? Sarasota is a dynamic community and a cultural hub. Ringling College of Art and Design, based in Sarasota, has been a great supporter of the council. President of the college, Dr. Larry Thompson has become a good friend and sits on my Luxury Collective Board. He and the college are familiar with the New York chapter and, when I started the Florida chapter, they called and immediately wanted to join. While planning the Sarasota International Design Summit, Larry asked if I would present on international marketing. Through that opportunity The Ritz-Carlton and Ringling College sponsored our launch during the same week. Frankly, Sarasota also provides connections in Tampa and Naples. This will give us the traction to open in those markets in early 2008. CB: What excites you about the luxury market? I was raised in Bethel Park, PA, a middle class suburb in the South Hills of Pittsburgh. My father's job as corporate chief pilot of a major corporation exposed me to the affluent at an early age. His work was our vacation and his CEO treated us like family. From our annual trips to the Masters, US Open, Mexico or the Caribbean, I witnessed firsthand how luxury marketers created their brands and established them in the mind of their consumers. In college, I majored in Advertising when the book Positioning: The Battle for Your Mind by Jack Trout and Al Ries was released. Between Rosser Reeves and Trout & Ries I was hooked. It made sense to me that if you’re going to be selling something to someone you ought to pick someone who has money and that you needed to explore the proper slot in which to position your brands. Luxury is exciting because innovation is an essential element, and it trickles downstream. Today's luxuries will mainstream tomorrow. To a large degree, the basic premise for luxury marketers remains “how do we create a message that is indelibly printed in the customer’s mind?” The difference is in the execution. CB: Given your experience in both flooring and the luxury markets, how might you reinvent the carpet market? Christine, we could spend days on this subject. The flooring business is product focused whereas it should be customer centric. Most stores are more reflective of a larger company’s mandatory displays rather than serving the customer with a total experience that will illuminate the value and importance of that specific retailer. Perhaps we change that first. Once you're focused on the customer rather than your competition you'll naturally want to start paying attention to your customer's experience with other service and product providers. Watch what's happening at the Mandarin Oriental or Bergdorf Goodman, and then explore ways to interpret it for your own business. Changing the buying experience requires vision, leadership and the guts to make the changes now rather than later. Like other professional luxury merchants, flooring retailers should be narrowly focused and deep. Stand for one thing and do it extraordinarily well. Consider this: the most highly trafficked "stores" are restaurants. Do you remember Morrison's Restaurants? The cafeterias that served everything? Well, they're gone, but they morphed into Ruby Tuesday. Consumers don't think they're getting a quality product if the retailer has no focus or point of view. What makes us think that flooring stores can miraculously serve everyone well? Most flooring retailers are still trying to emulate Morrison's. Consider the emergence of hardwood floor stores. They do one thing well - hardwood - and customers believe it. Customers want to know what they're walking into before they spend their precious time. The affluent often have more money than time, and you will never get them back if you waste their time. CB: What about flooring display systems? I’ve taken some heat for suggesting that retailers dump their wing-racks. We now live in a time of abundance. Your goal as a merchant should be to edit out anything that isn't consistent with your store's message and positioning. Research today tells us that customers are stymied by a huge selection. Wing racks exacerbate this situation. There are a couple exceptions to this rule. One is Karastan Gallery. Their brand has equity and keeping it intact makes sense. But, I can’t think of many more. Never forget that you store brand is the most important brand you have. I was in a major flooring retailer recently. They had supplier racks from virtually every decorative supplier I could think of. It looked silly. They would have done themselves and their customer a favor if they had taken all their 27 x 18s or 13 ½ x 18s and sorted them by color in their own display system. · It’s easier for the salesperson to sell. Of course, the reason they don’t do that is because they can’t manage the samples (or perhaps the loss of them). The store is more concerned about serving themselves or their reps than they are serving their customer. A sad situation and a long ways from reinventing the buying experience. Imagine an affluent client, desiring a blue wilton, walking into this store. She’s required to look at a couple thousand samples in many different sizes and several different displays or racks to try and find her one color. Christine, you’ve done a great job writing and speaking about the customer experience. Does anyone else see the issue here? CB: Is anyone doing it right? There are some flooring companies who get it. Lucia Schito from Bisazza understands that a retail environment must be consistent with their brand positioning. Lucia and Bisazza have created a stunning environment for a limited number of retailers. It elevates the category, and it makes you want to buy Bisazza regardless of the price. That's customer centric luxury marketing that serves the entire channel. Chris, many thanks for this peak into your world and for sharing perspective on how to improve the carpet/flooring retail experience. Readers, what is your take on luxury marketing? What about Chris' comments relating to the flooring experience? Do you agree or disagree? And consider Ad Age's article titled "New Year Not Looking Happy for Magazine Publishers In This Iffy Economy, Only Titles That Rely on Luxury Advertisers Seem Optimistic by Nat Ives from 12/03/2007. Note: the El Espectador Colombia article for which Chris was interviewed [see link above] is part of a full special section titled "Iconos Del Lujo" from 12/9 to 15/2007. Check out this cool badge. Have you noticed it on my sidebar? I'm very proud of it. It attests to my participation in the 2006 and 2007 Bathroom Blogfest. Designed by Susan Abbott from Customer Experience Crossroads, it captures the whimsical yet serious nature of the Bathroom Blogfest. After all, 24 accomplished writers had no trouble over a full week discussing the ladiesroom experience. From a variety of fascinating expert perspectives... while traveling, as artwork, as a communications vehicle, in museums and libraries, in restaurants, in retail establishments, at work, as brand statements.... It goes on! Through each post, the Bathroom Blogfest contributors illustrated unique ways of perceiving, evaluating and improving the overall user experience. Yes, ladiesrooms represent basic spaces, yet these spaces are critical to the overall brand experience and message. So, you see, Bathrooms do matter! And calling attention to what makes an optimal bathroom experience takes perception, dedication, humour and great enthusiasm. For that reason, I commend all of my fellow Bathroom Blogfesters and invite all participants in the 2007 Bathroom Blogfest to proudly display their badge and/or post about it. 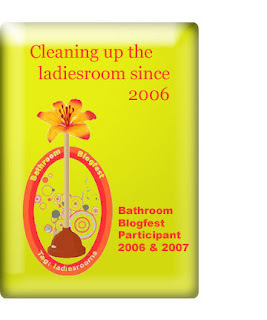 And, when you flaunt your badge, have it direct visitors to the Bathroom Blogfest group site! Via the Bathroom Blogfest Badge, I celebrate the enthusiasm and cleverness of this amazing community. Whether Bathrooms remain the subject of the next Blogfest or not, I guarantee that whatever the topic, this community will enthusiastically do it justice. I also predict that it will continue to grow. Do you remember, back in October, hearing about Blog Action Day, a really exciting and inspiring undertaking that literally involved people from around the entire globe all thinking, talking and writing about the same subject on the same day? In my post - Blog Action Day For The Environment - I mentioned the Energy Star Pledge to replace existing light bulbs with CFLs. Well, back in November, my company's Ultron carpet fiber division attended Greenbuild 2007 in Chicago. During that show, we announced our participation in the Energy Star Change A Light Pledge and handed out CFLs with the button pictured here. "Light Your Path With The Power of One" it says. Because we can each individually make a difference. I've made my pledge. Have you? 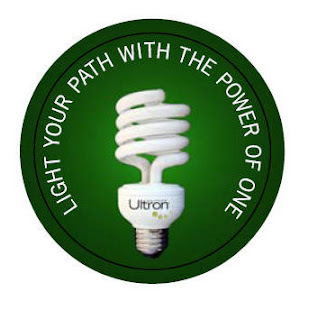 Would you join us in the Energy Star Change A Light Pledge? Join us, and let's each start making a difference together. As environmental awareness grows among American consumers, manufacturers are making great strides in introducing Eco-friendly products that promote healthy living for ourselves and our planet. The essential aim of green design is to produce living spaces, products and services in a way that reduces the use of non-renewable resources, minimizes environmental impact, and relates people with the natural environment. Green design is a reaction to our planet's "environmental crisis." The environmental crisis is a result of the rapid growth of human population and economic activity, combined with the depletion of natural resources and damage to ecosystems. Although environmental concerns have been in the interest of the American consumer, recent issues such as food shortages, rising fuel costs and global warming have pushed the subject back into the spotlight. Perhaps the sense of urgency of better environmental practices comes from the fact that as Americans, we are guilty of being one of the more wasteful nations on the planet. Although we make up on 5% of the planet's population, Americans consume 24% of the world's energy and 20% of the world's natural resources. But, many American consumers make purchasing decisions based on personal, social and environmental values. This group wants to integrate their values with brand choices and purchasing options. In fact LOHAS [Lifestyles of Health and Sustainability] which is a market segment focused on health and fitness, the environment, personal development and sustainable living describes a US marketplace of $226.8 billion for goods and services that appeal to consumers who share these values. From the automotive industry, to fashion runways and beauty products, manufacturers have excelled in expressing this movement with exciting new introductions. But nowhere is this trend more prevalent than in the home. From solar panels for energy efficiency, to roof water harvesting systems for landscape irrigation, tomorrow's home builders are learning to design and build with respect for the environment. In fact, a survey from the National Association of Home Builders shows that 64% of all home builders will be involved in green building projects this year. Once inside the home, new areas are being created that reflect nature, use Eco-friendly accessories and promote healthy living. This newest twist on the environmental movement expresses all the colors of nature, not just the earth tones of seasons past. 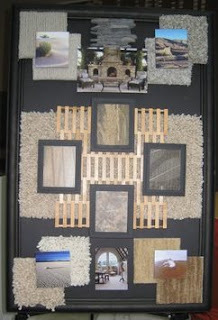 Also popular are textures and finishes that manifest nature into our decor. As the largest recycler in the floor covering industry, we at Mohawk are very proud of the fact that our environmental footprint gets smaller each year. Beginning with what we call the P.E.T. project, truckloads of water and soda bottles as well as rigid plastic food containers arrive at our plant. There's an old saying that "one man's trash is another man's treasure." And this is true of these bales of soda bottles. The bottles are made from polyethylene terephthalate or P.E.T. [common name polyester]. The plastics are sorted, ground, washed and then extruded into polyester fiber. Annually we take in 3 billion bottles - that's 25% of all bottles collected in North America - and produce 160 million pounds of recycled fiber. This fiber goes into our luxurious carpets, as well as Mohawk home products like designer pillows. But, it doesn't end there. Bottle caps, labels, shrink wrap from the pallets or any other similar items that are not suitable for carpet fiber are used in the production of plastic center cores on which we roll the finished carpet for transport. These plastic cores have 3 times the lifespan of cardboard, and are much less likely to break and damage the carpet. Most importantly, this process saves 68,000 trees per year. In another effort to keep materials out of our landfills, Mohawk began our non-woven division to take waste carpet and yarn and turn it into premium synthetic carpet pads. Since its beginning in 1999, Mohawk has produced 60 million square yards of carpet pad from 111 million pounds of recycled carpet. In addition, we actively participate in the Carpet America Recovery Effort [C.A.R. E.], and industry-wide and government initiative dedicated to the recycling and re-use of post consumer carpet. Mohawk Home annually recycles 720,000 tires into crumb rubber for designer door mats. In all, Mohawk has created 200 actual products made with recycled content. By recycling post consumer goods and waste into new products and using Eco-friendly materials at every opportunity, Mohawk continues its commitment to reducing and eliminating any negative impact on the environment. As you can see, the Mohawk buying experience is founded with the utmost consideration to style and accuracy. The validity of our trending process can be seen in the research we gather, the boards we create, and the products we introduce. It is a lengthy, but essential process whose ultimate goal is a superior product and a very satisfied customer. For more information about Mohawk's Eco-efforts, visit the Mohawk Greenworks Blog. Starting with Flooring Inspiration From Mohawk, read Color-Emotion From Mohawk - Part I, Part II - White, Part III - Going For Baroque, and Part IV - Desert Neutrals representing Mohawk's 2007 color presentation developed by Vickie Gilstrap, Nathan Hammett, Lauren Campbell, Luanne Holloway, Rebecca Frazee, Cliff Lyles, Susie Bell, Katherine Bugsch, and Michael Thompson. It ends with this post. She's Director of Blogging, Linking & Writing for WFCA and writes the blog Floor Talk! for the WFCA. Shannon and I met through the blogosphere. [She subscribes to Flooring The Consumer and sent me an enthusiastically complimentary email!] Furthermore, I'm very familiar with WFCA and Shannon's parent company, Design Center Solutions. I was curious about her and her blog and wanted to find out more. CB: Shannon, how long have you been blogging? CB: Who is the audience for Floor Talk!? Homeowners, home buyers and people interested in flooring and design looking for honest, trustworthy advice. I also like to include some information for DIY or people other than women who are shopping for floors or looking for design ideas and advice. CB: What is your goal for the blog? Our goal is to create a blog that is an extension of the WFCA.org focus which is to educate the public on flooring choices, new products and trends and provide people with information that will help them feel confident in their flooring choices via an interactive, ever-changing experience. CB: Can you describe how you interact with WFCA vs. DCS? Floor Talk! is a World Floor Covering Association sponsored blog. I write the content for Floor Talk! 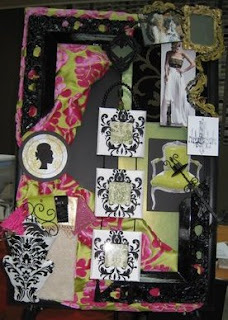 and some of the articles for Designer’s Corner on the WFCA website. Creating Your Space™ is a DCS Partnership Group and World Floor Covering Association Company that develops engaging websites for flooring retailers. Creating Your Space™ also built the WFCA’s website. My role includes responsibilities for both Floor Talk! and for Creating Your Space™. CB: which blogs do you follow and why? CB: how are you getting the word out about Floor Talk!? We subscribe to a lot of different social networking sites, primarily StumbleUpon and sk*rt. A link to the blog is on the WFCA website as well as all of our Creating Your Space™ client’s websites. I follow the advice from ProBlogger. Plus, I tell everyone that will listen. I also attend many industry events to keep up to date on products, manufacturers and trends. CB: How do you describe your blog to flooring friends? I haven’t written about any retailers yet, but I have told a few that I think it is a good supplement to their sales process. I encourage them to share the blog with their customers for an honest third party opinion. I also encourage them to send frequently asked questions they receive from their customers or have their customers submit questions. I would like to feature some retailers and builders in the future. I tell them that it is directed to homeowners and buyers who are looking for information on flooring and design. If they have a product that is unique or has an unusual application, I would love to share it with the public. Suppliers are very appreciative of any mention on the blog and do a great job of keeping me in the loop with what’s new and different. CB: How do you find doing Floor Talk!? I love, love, love writing this blog. I have been in this business my whole life. My parents run a contracting business, design business and paint store in SC. I started there studying design under my aunt…and fell in love with flooring of all things. Then moved on to a flooring retailer because I thought I wanted to focus on one aspect of design. There I got the pleasure of opening a design center from the ground up. It was like starting my own business with someone else’s money!! CB: What kind of reactions are you getting? People are very kind so far. A trade magazine is going to mention us in their next issue. I thought that was cool…. Our stats are slowly building. One of my designer friends calls me the Carrie Bradshaw of Flooring. I thought that was cute! If you get a chance, do visit Shannon at Floor Talk! and leave her a comment. Disclosure: we work with DCS. The desert provides a beautiful display of colors and textures that serve as inspiration for our homes. Consumers continue to reach out to nature as a way to connect with what is comforting and real for their home. Neutrals are a constant in home decor, but their character and personality are always changing. Last year we saw colors moving in a personal direction that fit with the trend of Glamour and Sophistication. The result was the skin tone neutrals that are still visible today. Now, as we become more environmentally aware, we see a shift toward earth tones that are elements of deserts around the globe. The colors in this palette provide a soothing, earthy take on neutrals. Gray is warming up. Browns have taken on both warm and cool directions. From cooler khakis, to warm camels, to the golden yellows of the sun. Natural materials continue to be used heavily in products for the home. Wood is most prevalent in raw, rough, "found" looks. Branches and twigs are abundantly found as art forms and in interesting accent products for the home. Stones are another element from nature that are being used in home products in their natural form. Natural fabrics are being used often, with linen being at the top of the list. Other natural items seen as decorative products for the home include: seedpods used in their natural state or made of wood or other materials. Flowers are in full bloom with roses making the dominant statement. Ginkgo leaves are showing up as a fresh design motif for the home scene. Also look for seashells to accent the decor. One of the most forward directions for the nature trend is the growing popularity of outdoor living. Rooms are being created outdoors that were previously thought of as "indoor only," such as an airy kitchen in a gazebo. Outdoor bars are numerous and popular for entertaining. Courtyards and patios are favorites for relaxation. Outdoor fireplaces are "hot" and popular for enjoying the outdoors and entertaining all year round. More and more fabrics and rugs are being designed to be weather resistant to meet the needs of this trend. Outdoor living spaces for the home have almost become a necessity. Expect to see a strong and growing emphasis on the merging of indoor and outdoor living, now and in the years to come. The look and feel of nature for the home will continue to be a constant. It is the twists and turns of this trend that will be interesting to watch as we look to our natural surroundings for comfort and peace as our concern for the environment continues to grow. Starting with Flooring Inspiration From Mohawk, read more about Color-Emotion From Mohawk - Part I, Part II - White, and Part III - Going For Baroque representing Mohawk's 2007 color presentation developed by Vickie Gilstrap, Nathan Hammett, Lauren Campbell, Luanne Holloway, Rebecca Frazee, Cliff Lyles, Susie Bell, Katherine Bugsch, and Michael Thompson. Inspired by the popular movie Marie Antoinette, comes a renewed interest in 18th century French style, with all of its curves and embellishments. French influences are being seen everywhere from more formal settings, to a resurgence of French country casual. In many applications, soft pastel shades set the tone. The popularity of this timeless look has inspired a trend called "Baroque Meets Modern." But modern Baroque offers a very different twist from classic Baroque. The trend takes the classic, traditional curves and looks of the 18th century to a more contemporary, simplified level with the use of bold colors and fabrics and large scale motifs. The modern Baroque look is being seen on the runway with an emphasis on black, using gold metallic, richly ornamented fabrics and accessories, and embellished details. Chandeliers in surprising colors are an important icon for modern Baroque. Oversized damasks are one of the most recognizable motifs of modern Baroque. This trend is a good look to blend with other styles as we express our need to individualize our decor. Many consumers have tired of decorating in only one particular style. As global lines merge, the consumer is more aware of the many different cultures and styles of design in the world. The result is a very eclectic movement in decor. The eclectic look doesn't have to be designed all at onece. It is an adventure and a process to be enjoyed and accumulated in a lifetime as we grow, travel, and become more aware of our world. Starting with Flooring Inspiration From Mohawk, read more about Color-Emotion From Mohawk - Part I, and Part II - White representing Mohawk's 2007 color presentation developed by Vickie Gilstrap, Nathan Hammett, Lauren Campbell, Luanne Holloway, Rebecca Frazee, Cliff Lyles, Susie Bell, Katherine Bugsch, and Michael Thompson. "Top of Mind" originally uploaded by Tatah. Chris Brown from Branding & Marketing recently passed the "Staying Top of Mind" Challenge on to me. + It should help your customers or potential customers think of your services. What a fascinating and relevant challenge! We're busy, bombarded with meaningless messages, stretched and stressed for time. Yet, we also appreciate respectful efforts to forge valuable relationship. How to create value? Hmmm. Well, what doesn't offer value? Take this situation. The regional representative for Corporate Express regularly calls me. He's obviously being graded on how many calls he makes to his customer list, and I'm on it. These are forced, awkward efforts to tell me about the latest, greatest office product deals. The calls are useless and waste my time. Here's why. I'm an online customer and order specific items [paper, toner] when I run out. I'm not ordering for a large office and yet that's what these calls are geared toward. Does that make sense? I much prefer an email acknowledgement that offers guidance on how to handle a problem. Even better is a paper or email reminder [as my online pharmacy Medco does] that I'm due for a refill, with a link to the items I normally order. That represents value to me. Jack Mitchell epitomizes this type of intelligent staying top of mind thinking in A Good Hug is Worth and Hugs or Relentless Customer Focus! Isn't it about considering and anticipating all aspects of the relationship? + Acknowledge and thank at every opportunity: in person, via email, or through handwritten notes. Feature people and companies in relevant work [presentations, blogposts, referrals] and let them know about it. + Use any system that works for you to keep track of dates, ideas, people that you associate with a person so you have a reason to connect in a timely manner. + Constantly be on the lookout for relevant links, photos, or articles of interest and forward those as appropriate via email, twitter, snailmail. Do you remember how Melanie Griffith in Working Girl constantly read newspapers and magazines looking for connections? We're lucky in that the Internet and blogs make that easier than ever. We have Google alerts, Technorati, del.icio.us... Our challenge, though, is to bridge the virtual world with the world that most of our clients, customers, consumers and family still live in, gently taking them by the hand to initiate and welcome them into what's available digitally. Isn't that a way to offer value, build relationship and stay top of mind? Especially when doing it in a genuine and selfless way. + Brad Shorr at Word Sell: he recently honored me with The ClueTrain Manifesto. Talk about never forgetting someone! + Arun Rajagopal: his amazing marketing efforts landed a mindblogging coup for The Age of Conversation. And, Becky Carroll has some terrific responses to this challenge in Staying Top of Mind with Customers.